The massive plume from the Camp Fire, burning in the Feather River Canyon near Paradise, Calif., wafts over the Sacramento Valley as seen from Chico, Calif., on Thursday, Nov. 8, 2018. The Camp Fire has scorched over 28 square miles in Butte County, which is about 90 miles north of Sacramento, according to Cal Fire. Late Thursday, fire officials said people have been injured and structures have been destroyed in the fire, though further details were not available. Also late Thursday, acting California Gov. Gavin Newsom declared a state of emergency in Butte County. The fire is burning about 80 acres per minute, according to UCLA climate scientist Daniel Swain. That's equal to about 60 football fields per minute. “This fire is very dangerous, please evacuate if asked to do so!”, Cal Fire officials said on Twitter. Dozens of resources were being called in from throughout the state. 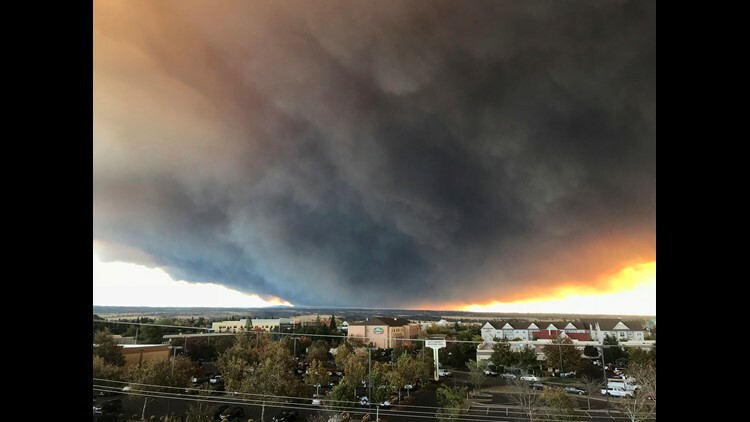 An evacuation order was issued for areas of Paradise, a town of about 27,000 people, the Butte County Sheriff's Office said. Fire officials said firefighters were working to access the area as the blaze continued to spread. Social media feeds from the area described extreme traffic jams and frantic evacuations. Butte County Sheriff Kory Honea confirmed that people had to abandon their vehicles as they try to flee the fast-moving fire, which was 0 percent contained. In Paradise, the Adventist Health Feather River hospital said it has evacuated its patients to other area hospitals because of the fire. Shary Bernacett said she and her husband tried to get people to leave the mobile home park they manage in Paradise, with just minutes to evacuate as the wildfire approached. The two “knocked on doors, yelled and screamed” to alert as many of the residents of 53 mobile homes and recreational vehicles as possible to leave the area. “My husband tried his best to get everybody out. The whole hill’s on fire. God help us!”” Bernacett said. The couple grabbed their dog, jumped in their pickup and drove through flames before getting to safety on Highway 99, she said. The Butte County Sheriff told residents on Twitter that "if you are unable to take large animals, leave them in open pastures and leave food out. DO NOT lock them up in a barn." Heavy ash was reported falling as far as away as Chico, about 14 miles west of the fire. The risk of fire danger was high throughout the state on Thursday, AccuWeather said. 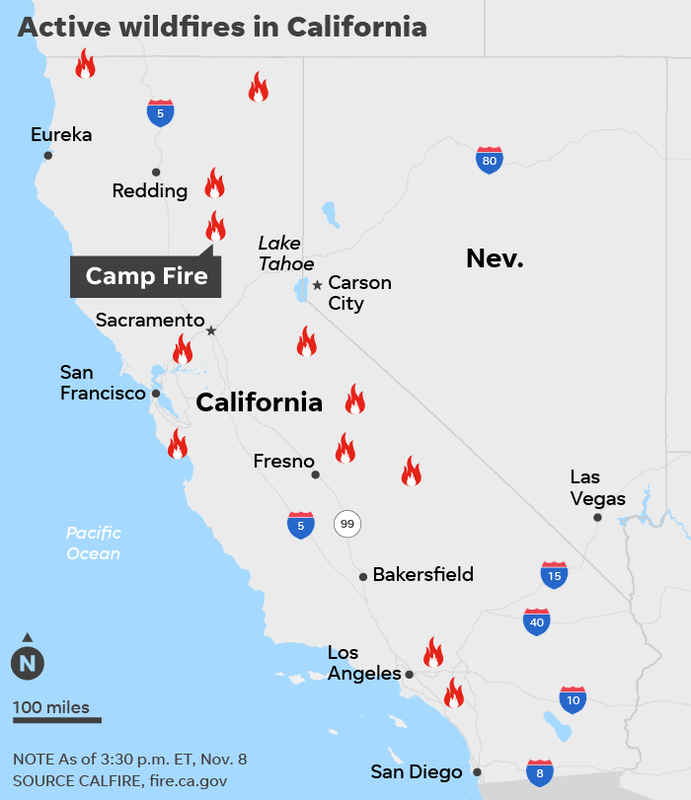 "The combination of ongoing drought, high winds and very low relative humidity will lead to dangerous conditions for fire weather in parts of California," the National Weather Service said. Widespread red flag warnings are also in effect. Contributing: The Associated Press; KXTV-TV, Sacramento, Calif.